Crews work on framing up the last few concrete forms inside Alfond Arena in Orono Friday. 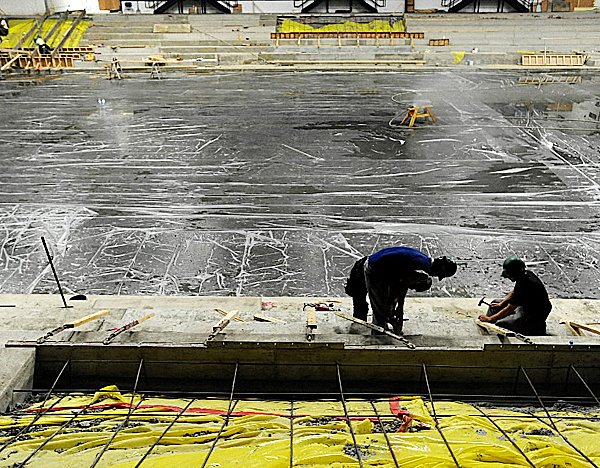 The largest portions of the work include installing a brand new cooling system for the ice and also replacing the seats in the lower section of the arena. Alfond Arena has long been hailed as one of the best places in the country to watch a college hockey game. And upon completion of the $4.85 million renovation project now under way at the arena, the University of Maine hopes it will be an even better experience. The Alfond Family Foundation in April announced a gift of $3.5 million toward the project, which will address infrastructure issues pertaining mostly to ice maintenance, climate control and seating. Work on the 35-year-old arena began in May. The planned improvements include a high-efficiency ice chiller system, a new concrete floor, upgraded seating and aisles in the lower bowl, a ducted dehumidifier system, an upgraded electrical system and generator and new dasher boards and glass. Led by the Portland firm Wright-Ryan Construction, crews expect to have the facility ready for the Black Bear women’s hockey team’s season opener scheduled for Sept. 23. The most complicated facet of the renovation project is nearly complete. That involved tearing up the concrete floor and the cooling system pipes underneath in order to install a new chilling system. UMaine officials held their collective breath as crews dug all the way down to the layer of soil underneath the old pipes. “We could have had several feet of frost buildup underneath the concrete,” which would have created more work and increased the price tag of the project substantially, Biberstein said. “Luckily, there was no frost,” he added, explaining the original design had provided a successful thermal barrier. Workers have now completed that phase, installing a warm floor, then a layer of insulation, topped by the plumbing and reinforcement bar grid and covered in poured concrete. “That’s in and it takes about 28-30 days of curing before we are going to start making ice,” Biberstein said. Still, there is much more to be done. Crews are replacing the concrete that will support new seating on the first level on the east and west sides of the building. The new chairs all have backs and are positioned so there is more space between the rows. The aisles are wider and will provide fans with railings to help them make their way up and down the steps. UMaine also has increased the number of handicap-accessible seating areas. The seating on the north (balcony) and south (luxury box) ends will be replaced with similar stadium-style bleachers like those installed on the side sections of the upper levels. Hussey Seating Company of North Berwick, which installed the seats and benches during the 1990 renovation of the Alfond, was awarded the contract for the upgraded seating. UMaine did have to make a concession in order to replace the lower-bowl seating. The new configuration, which took into consideration safety concerns, means the arena will have approximately 400 fewer seats in the section closest to the ice. Biberstein said the hockey capacity for Alfond Arena will go from about 5,400 to somewhere near 5,000. “A lot of our decision-making was to make sure that we could maintain the atmosphere and the fan experience,” he said. However, fewer seats means a reduction in ticket revenue, provided the seats were expected to be occupied. If the average ticket price is $20, that could result in a loss of $8,000 per home game. UMaine averaged 4,928 fans at home games last season, an increase of 637 over 2009-10. If it can maintain or increase those numbers this season, it means Alfond Arena will be nearly full, not taking into consideration handicapped seating and standing room spaces. “Hopefully, the experience and the new seating and comfort will start enticing fans to buy their season tickets,” Biberstein said. UMaine has averaged 2,400 men’s hockey season-ticket holders over the last three seasons, according to university figures. and Sunrise Materials of Orono. The new ice chiller system utilizes safer coolant and is more energy efficient, resulting in ice that approaches NHL standards. Alfond Arena should be able to avoid future occurrences of “fog” in the building and condensation on the basketball court. That’s because the renovations will include the installation of two dehumidifiers on the north side of the building that will pump drier air throughout the facility via duct work close to the ceiling. The temperature also should be more consistent, which should benefit basketball players and fans who have complained in the past about the arena being cold. “It should be a better experience for our basketball fans as well, said Biberstein, who explained there will be a new generator and upgraded electric emergency management system. Among the last items to be positioned will be the dasher boards and glass for the rink. The dashers have been reconditioned, rather than replaced, while the glass is new. Then there is the issue of the sound system, which has been studied extensively. UMaine officials plan to wait until the rest of the work is finished to determine the best solution. The sound system is not included in the contract for the renovations. Throughout the project, the main concern has been to make sure the work is done well. A lot of these changes are long-term infrastructure improvements to keep the improved Alfond safe and standing strong for another 36 years,” Biberstein said. As they wait for the work to be completed, UMaine’s hockey teams won’t be relegated to using roller blades for their workouts during the first half of September. Biberstein explained Penobscot Ice Arena in Brewer is open and the Bears will be able to get in their skating at that facility in the meantime.